Qualification: M.Sc (Nursing) in Mental Health Nursing. As Per Norms laid down by INC, New Delhi. Desirable: Ph.D (in Nursing) and Should have Published at least one article in reputed indexed journal. Selection Procedure: Only Shortlisted Candidates will be called for Interview. 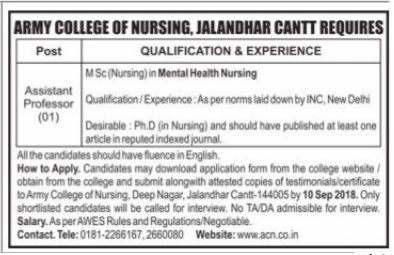 How to Apply: Candidates May down load application form the college website/obtain from the College and submit along with attested copies of testimonials/Certificate to Army college of Nursing, Deep Nagar, Jalandhar Cantt - 144005 by 10th Sept 2018. 0 Response to "Cantonment Board Jalandhar Jobs 2018-2019 For Assistant Professor Posts"